This week I read a well researched, compelling article in Collector’s Weekly called “The Death of Flair: As Friday’s Goes Minimalist, What Happens to the Antiques?“. I highly recommend you follow that link and read the article yourself. It follows the history of the “casual theme restaurant” like T.G.I Fridays from hot 1970s singles bar to cliché family establishment. The decor in these restaurants has always relied on huge collections of nostalgia and antiques. Now that the designs are changing to be more minimalist (and apparently, Millennial approved), the old stuff is coming off the walls. The old T.G.I Fridays on left, new design on right. Images via Collector’s Weekly. I found it very interesting to learn about the networks of antique pickers and dealers who make restaurant decor their business. 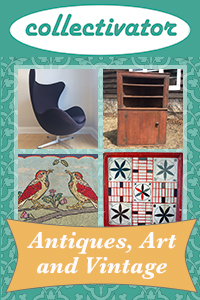 Throughout the years, the market went through trends that affected what antiques were in demand. When the restaurant chains started in the 1970s, they wanted bang for their buck. Whatever was abundant and affordable made the cut, and that’s why items like porcelain signs, stained glass windows and Tiffany style lamps became standard. As these same categories of antiques became harder to find, and more expensive, reproduction or “fantasy antiques” (I love that term) were added to the mix. My favourite part of the article includes a short video on the massive Tennessee warehouse that still holds all the 90,000 individual antiques used in Cracker Barrel restaurants (unlike the other chains, Cracker Barrel is expected to keep with their antique tradition). This family business grew with the popularity of the restaurant; from local antique dealers to networked provider for a large national chain. It’s pretty amazing to see what is essentially a library filled with categories of antiques instead of books. Each and every Cracker Barrel restaurant uses approximately 1,000 antiques in their dining rooms and 99% of their decor is authentic. Doesn’t that warehouse look like a fascinating place to visit? A few years ago on a trip to Nashville, we made it a point to visit the local Cracker Barrel. It was my first time encountering this temple of Southern Americana. Everything from the rocking chairs on the front porch to the shotgun mounted on the wall added to the impact. There were large advertising signs mounted with old musical instruments, photographs, clocks and farm tools. It was kitsch but it was also interesting. I could see that some items were worth more than others but they were all mixed together into a cohesive whole. In this way, Cracker Barrels are like Tiki bars – they represent a getaway into an idealized version of the past. The nostalgia is real because the items are real. They also serve huge breakfasts for very reasonable prices (go for the antiques and stay for the grits). I came away from this article with a new appreciation for the business of American restaurant decor, and the use of antiques in that industry. I hope restaurants don’t get overly “tasteful” and boring in their desire to appeal to the younger generation. On one hand, yes, Millennials don’t like tons of stuff on the walls, but on the other hand they value the idea of authenticity. You can’t throw a rock in a hip restaurant these days without hitting an Edison bulb or rusty industrial relic. Times change and what is cool now will seem outdated soon. I might be a dying breed but I don’t go out to stare at my phone. Let’s keep something interesting on the walls. If it can be something antique all the better.